Village of The Hills is a city with predominantly single-family homes and only one “business” in the community – The Hills Country Club. The Hills of Lakeway is the host of an annual PGA golf tournament. No other private country club in Central Texas gives members access to 36 championship holes by Nicklaus Design, as well as a variety of membership opportunities. Home to The Hills, this was the region’s first Jack Nicklaus signature golf course. In addition to spectacular Nicklaus designed golf courses you enjoy magnificent waterfalls, rolling hills, and beautiful estate homes, all of which accentuates life in the beautiful Texas Hill Country. Get a hole by hole breakdown, to see how truly remarkable the course at The Hills is. The Hills and Flintrock Falls clubhouses afford members both formal and casual dining, private event and meeting room facilities. The Live Oak and Yaupon clubhouses provide a casual dining option for members as well. It also has a manned and gated entrance 24 hours a day. Homes in The Hills are typically owned by retirees who prefer little to no back yard. Located just outside the Lakeway city limits and near Lake Travis, it's also convenient to the new Hill Country Galleria Mall, the new Lakeway Regional Medical Center, and shopping. Working residents can commute to Austin in about 30 minutes, and Westlake Hills in 20 minutes. The City of Lakeway sits on the banks of beautiful Lake Travis. Lake Travis schools are highly rated, and their sports programs are extremely successful as the Lake Travis Cavaliers High school football team has taken the state title four years, 2007, 2008 & 2009, 2011. Congratulations to all of these fine athletes! The property (ad valorem) tax rate in Village of The Hills is $ .04 per hundred and there is no sales tax. 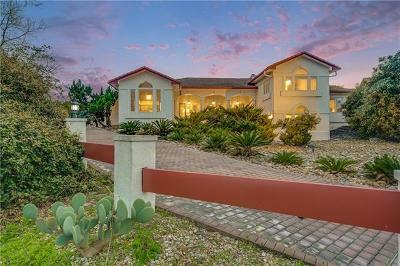 Homes for sale in the Hills of Lakeway typically run from the low $300's-low $800's. The City of Lakeway is nestled on the south shore of Lake Travis, app. a 25 minute drive from downtown Austin. For a complete analysis of the City of Lakeway demographics, population, schools, income etc., please click here. 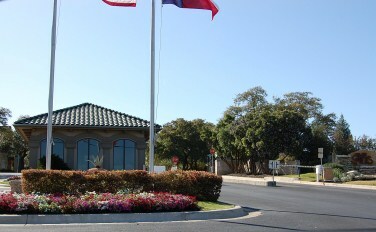 Lakeway is also well known for "The Hills" Country Club and Village of the Hills community. Residents also are happy to have the new Lakeway Regional Medical Center now open as well. The City of Lakeway is only a few minutes drive to downtown Austin, Bee Cave, Cedar Park, Westlake Hills, and Lake Travis. The new Hill Country Galleria is a new outdoor shopping venue located in Bee Cave just a couple minutes away. Homes in the City of Lakeway range from the low $200's to several million dollars. Lakeway elementary, middle school kids attend Hudson Bend, and high school kids attend Lake Travis high school.